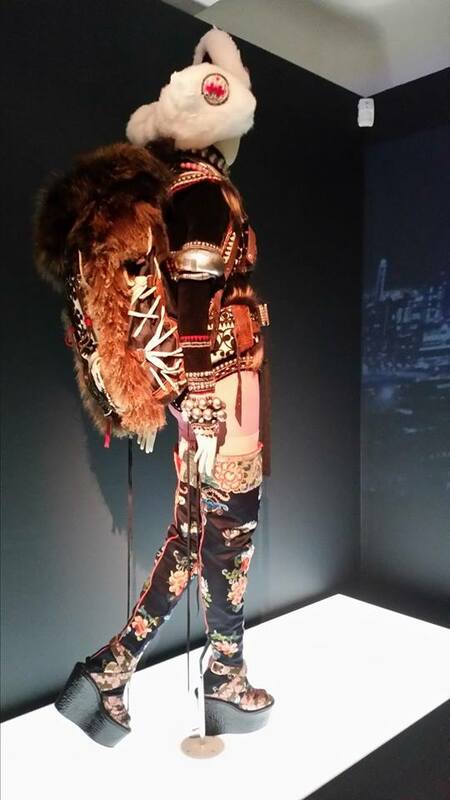 This is one of the designs on exhibition at The Fashion World of Jean Paul Gaultier From the Sidewalk to the Catwalk (until 25 Aug. 2014), which is on at the Barbican. The image is courtesy of Kelly Curtis. Last year I wrote this diffuse poem. The setting is the large ice-mass that perhaps once bridged Siberia with North of America. A couple are migrating across this inhospitable realm. Imagine the pair dressed in furs, with all their worldly possessions in tow – tent, working dogs, blankets, food and household items tied to sleds. In the poem they are travelling towards the dragon’s gate. This endpoint motivates the woman with hope; it propels the man through sworn duty and allegiance. Both are so focussed on this outward destination – a gate in all its majestic and architectural wonder – that they are not aware of the small stirrings of life. The “soft pearl” is a growing child who embodies the para-reality of their journey and relationship. In contrast with the gate, a settled and solid structure, the child is something organic that will change and is less definable. “Solutrean Hypothesis” is one of twenty-five poems that feature in my book Emily’s Poems for Modern Boys. 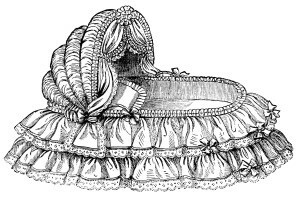 Image courtesy of The Old Design Shop (http://olddesignshop.com/), Vintage Image Treasury. Send in your questions about a particular poem, a running theme or even a line that puzzles you. If you’re curious about the creative process behind a poem’s existence, you may ask about that, too. This poem (Five Consequences of Repeated Actions) covers recurring discussion points of so many of my (female) peers at present: the difficult job market, not being able to put aside financially for the future and the biological clock. The further question is – of all the things you do in a day, which one will be the most important? If you do not pursue your calling (e.g. writing), will this really have an effect in twenty years’ time. Does what one do today really have such a huge outcome on twenty years down the line? I write daily and try to remind myself of my commitment to this path and craft. But for what? Will the world really be any poorer for my wallowing in creative self-indulgence, when perhaps I should be paying into a pension and salvaging some sort of career track? The literal and literary irony of this little poem is that it does exist. Whether or not it hovers in the ether in twenty years’ time is an outcome yet to be determined.